Almost three years ago, deep in the heart of the BBC, Glenn Tilbrook was preparing to perform with Squeeze on The Andrew Marr Show. Sitting on the coach, ready to listen, was former Prime Minster of Great Britain, David Cameron. "I grew up in council housing, part of what made Britain great. There are some here who are hellbent, on the destruction of the welfare state." Glenn is in fine form, not just a political Machiavellian who reels off soundbites and headlines, Glenn has made an effort to inform himself greatly, and it's how he came across The Trussell Trust – the charity he will be raising money for on his upcoming UK Tour. It's clear to see in the way he talks about it that, for him, this is a new raison d'être. "I watched a programme on the iPlayer about foodbanks, and it really stayed with me. "The grinding desperation of people who don't have enough food to put on the table for their kids. "Anyone can end up in that situation and I'm ashamed that in 2019 our politicians can't come up with a better solution." In 2017-2018, 1,332,952 three day emergency food supplies were provided to people referred to foodbanks in The Trussell Trust's network, a 13% increase on the previous year. "I just wanted to help The Trussell Trust and what they do with coordinating collections and distribution. "It's just a very practical solution to a heart-breaking problem." Audience members will be able to donate non-perishable foods and other essential items at all venues, where they"ll be collected by the local foodbank. Glenn also released a solo acoustic EP to raise money during his own tour dates. "I wanted it to be really stripped back and just me singing and playing because I've never really done that before." 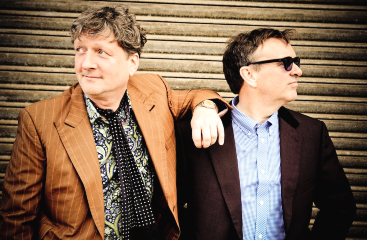 Ever the musical tinkerer, Glenn's voice rises in excitement at the prospect of trying new things out on the road during this upcoming tour, aptly titled The Difford And Tilbrook Songbook. "We've had something of a renaissance in the last few years, and look forward to this continuing, as we will play a set of songs that are both new, contemporary and as innovative as people have come to expect from us, along with the old beauties." Glenn is quick to admit that foodbanks, however good, are not the definitive answer to a larger crisis. "I think there's a demonization of poor people that"s been going on too long, where they somehow seem as spongers if they don't have enough money." "I grew up in council housing and my parents can remember when being poor was an awful stigma. "You had no help from the government, and we seem to be gradually wending our way back to that position." Do you think it's a sense of apathy? "Maybe apathy on the part of people that let this sort of thing happen, but I don't think its political apathy," he pauses. "I think it's sort of an agenda - not to create poverty - but poverty is the byproduct of a totally free market society." There's a point to be made, that while some of Squeeze's later records have been extremely politically charged (cuts like A&E and Rough Ride from 2017's The Knowledge are a call to arms for the country's welfare departments), their early records are just as poignant. "I think the politics of songs like 'Labelled With Love' and 'Up The Junction' were more personal, but coming from a similar place." From a similar place of the troubles of the ordinary working person? "Exactly that. Honestly, 'Up The Junction' could be a Trussell Trust story you know?" Begging may not be his business, but Glenn comes across as someone making a genuine and concerted effort to better his fellow man, and all power to him. In the age of celebrities getting involved in politics, Glenn and Chris are putting their money where their mouth is, and singing for not just their own supper this autumn. Squeeze - with special guests Heaven 17 - play The Brighton Centre, on Saturday 26th October 2019. For tickets CLICK HERE.